Parkinson’s disease affects more than 10 million people worldwide, with 10% of these being diagnosed before the age of 50. Parkinson’s disease has a variety of symptoms but can often cause pronounced and uncontrollable shaking in sufferer’s hands, which can make everyday tasks such as making a cup of tea or writing nearly impossible. A young sufferer of young-onset Parkinson’s has been the first in the world to benefit from a revolutionary new piece of technology. Emma is 33 and was diagnosed with early-onset Parkinson’s four years ago. One of her symptoms is a pronounced hand tremor which has made her job as a graphic designer increasingly challenging. The tremor has stopped her from being able to write or draw straight lines, leading her to worry about her future in the graphic design industry. A solution came in the form of a new series on BBC2 in the UK, called ‘The Big Life Fix with Simon Reeve’. The show is based around the idea that young engineers and designers are challenged with solving life-changing problems for people like Emma. The show enlisted the help of Haiyan Zhang, Innovation Director at Microsoft Research Cambridge. Zhang’s solution was to create a device approximately the size of a wristwatch, which deliberately vibrates the users arm. Whilst this might sound as though it could make the situation for Emma worse, in fact the opposite was true. The theory is that the additional vibration confuses the brain of the wearer, by interrupting the feedback loop which causes the movement issue. The result is that their own tremor is vastly reduced. This allows them to write and draw with a precision that was previously unobtainable. When Emma wore the device, nicknamed for obvious reasons, The Emma’ for the first time, she was soon able to write her name clearly, and draw a straight line with relative ease. Whilst this might sound like a minor achievement, it is something she hasn’t been able to do for the past three years. Emma has been wearing the device every day for the past few months and says it has improved her quality of life. 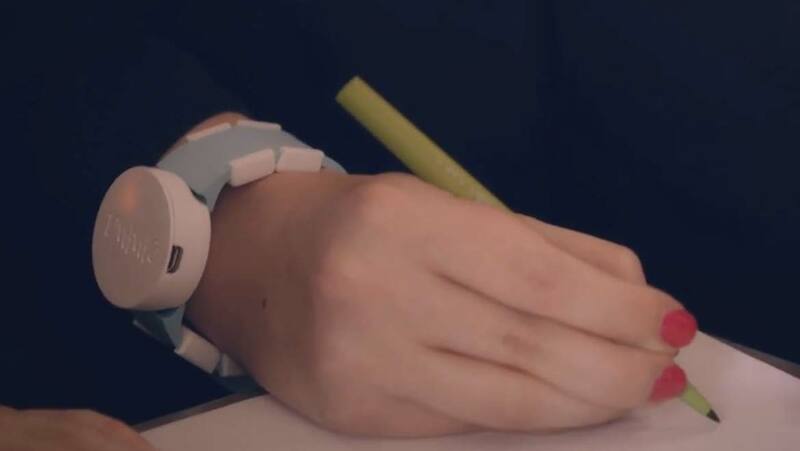 Whilst this device is a prototype developed particularly with Emma in mind, Zhang hopes that other researchers will draw inspiration from her project and look into developing this fantastic new technology further.